One headline among many published by the national Press when Marie Louise Killick won her ten-year legal battle against Pye Radio for infringement of her patent on a revolutionary record stylus. “Her inspirational invention was nothing short of ingenious — was to say, rather than profile the end of the sapphire stylus to fit ideally the whole of the groove geometry, let’s truncate it, let’s cut off a bit at the tip, so that the stylus can only monitor or track the upper portion of the groove. And there was no doubt about it, her early experiments indicated that a truncated stylus had enormous advantages in terms of record wear, stylus quality of reproduction and frequency response, but more importantly it reduced distortion. 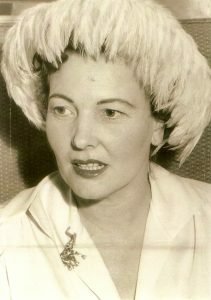 Marie Killick had trained in the 1940s as an audio engineer. Soon after the outbreak of the Second World War she got involved in the manufacture of the steel cutters that were used to make master recordings on wax discs. Borrowing a small amount of money from a bank, she set about finding contracts for her business and was awarded a contract by the War Office. They asked her to produce cutters for making direct recordings on the fields of battle; she also designed a portable recorder for that purpose. In the late 1930s and early 40s, recordings on 78rpm shellac records were played using steel needles with a sharp point. The needle rode on the bottom of the groove. As well as producing a very poor sound reproduction, this also caused the needle to act as a chisel, tearing into the record groove and destroying the recording, often in one playing. Intrigued by the problem, Marie set about looking for a solution. Her innovation was a sapphire or diamond gemstone, mounted on the end of the stylus and ground to a flat at its tip. Her stylus did not tear into the bottom of the groove but rode on the sides, doing away with sound distortion and crackle, and the damage done to the record groove. On October 25th 1945 she lodged her application, for Improvements relating to Styli for Sound Reproducing, at the Patent Office in London. Marie was granted a full Letters Patent, No. 603,606 on June 18th 1948. Applications for world patents were to follow. In 1945, under the protection of her British Patent, Marie manufactured her stylus at 117/120 Fleet Street, London. Her invention — marketed under the trade name Sapphox — was instrumental in opening up the record market. This was followed swiftly by the birth of the ‘Teenager’ phenomenon and the rock and roll era of the 1950s and all that meant to the record industry. An inspirational invention! Decca Ltd became interested in her stylus and after exhaustive tests declared it to be “the finest thing on the market” and offered her £750,000 for all her rights in the British patent. She refused their offer, preferring to market her invention. Her business was expanding and the styli were selling like hot cakes. 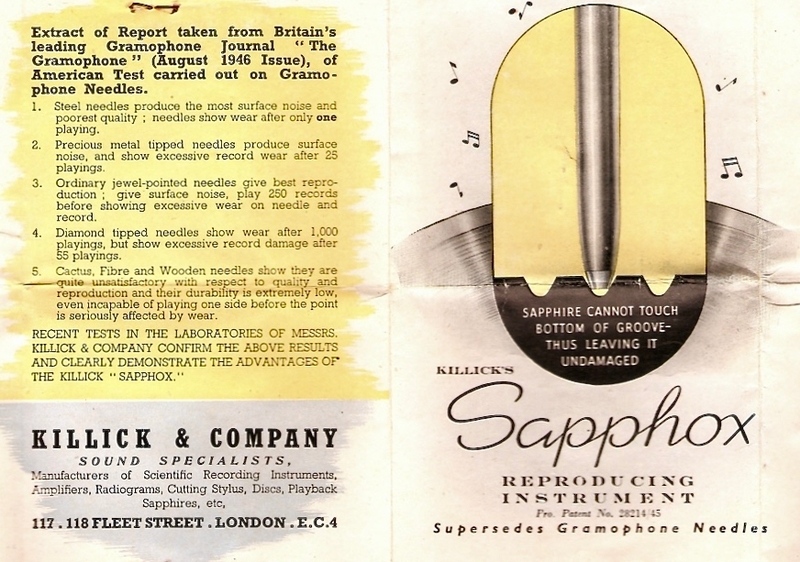 To cope with demand, she invented an automatic Sapphire Lapping Machine; capable of producing 10,000 styli per week, it would enable her to fulfil her growing orders. On November 8th 1945, Marie applied for a patent to protect this machine. Things were looking good. The Odeon cinema group were using her stylus in their cinemas and were full of praise for it. King George VI, on attending a gala performance of the film Hamlet, praised the organisation for the sound quality. Dark clouds were gathering on the horizon, however. Without explanation, Marie’s orders were beginning to shrink. After lengthy investigations she discovered that Pye Radio of Cambridge were flooding the market with a record stylus they named the Universal Stylus – and this was later to prove an infringement of her Letters Patent. On August 8th 1953, Marie issued a writ on Pye for infringement. The case came before the High Court in London nearly four years later, in 1957. She was awarded judgement in her favour by Justice Lloyd-Jacob on December 21st, after a two-week hearing — awarding her full heads of Damages and costs. Pye Ltd had lost but lodged an appeal. At the Appeal Court, the three judges upheld the judgement of the lower court and, having no cause to go to the House of Lords, victory was awarded to Marie Killick. She had only to put in her claim for damages for the loss of her business and world patents, her home and her children’s education. Pye Ltd, however, had not finished with Marie. This website contains a summary of Maries’ life, her invention and legal victory and the tragic aftermath of the case against Pye. 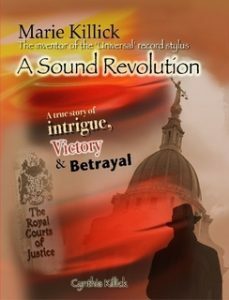 A full account of their dirty tricks and intimidating behaviour can be found in the book written by her daughter Cynthia Killick; A Sound Revolution may be obtained via the link on this site’s sidebar.